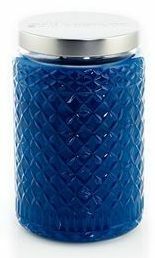 Loved the color of this candle… the wax was a bright and vivid cobalt blue and so pretty housed inside the diamond glass vessel. The scent… a fresh and unique blueberry that didn’t really smell like blueberry at all. It smelled like a fresh and clean soap. Shimmering. Sweet. Bright. Notes of Blueberry, Poppy, Salt & Sandalwood. I don’t really smell blueberry or sandalwood. Salt – affirmative. Poppy? I have no idea what that smells like. Overall, this was an interesting scent I wasn’t sure I liked. Would the blueberry come to life? I hope so since that was the main reason I purchased this candle. I lit this candle in my master bedroom to start out and waited for the magic to begin. Once the wicks were lit, it took about 15 minutes to reach a full melt pool and from then on out… my bedroom smelled like – I don’t even know… an ozone kind of fragrance that reminded me of a zesty and harsh soap. No blueberry, no sandalwood, maybe salt but it was hard to tell. In all honestly, the scent was so different, I can’t even describe it to you. Ozone would be the one word that comes to mind. A very harsh kind of laundry detergent smell. It’s just one of those fragrances you’ll have to experience yourself to see what I mean. And who knows, you may like it. I just know that I didn’t. Strength – This candle was strong, I’ll give it that. On a scale of 1 to 10, I would rate this candle a 10 across the board in any size room. This candle burned fine for the amount of time I burned it for. One full day. No wick issues that I could see. I’m a little bummed I didn’t care for this scent. I wanted to but it just wasn’t meant to be. It smelled too harsh for me and it simply wasn’t my cup of tea. That’s a personal choice… if you get a chance to smell Blueberry + Himalayan Salt, you may think differently. Who knows… we all have different sniffers. ? 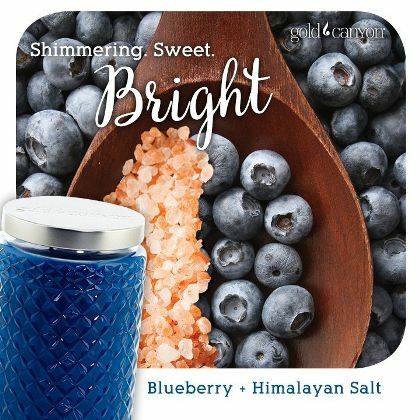 I don’t see Blueberry + Himalayan Salt listed on Gold Canyon’s site right now but it wasn’t that long ago I purchased this so I’m thinking it’s still around. Even though I personally didn’t care for this candle, it still rates high since it met all the criteria we look for in a candle.